Comment: this bunch of 13 tracks used to be quite rare because of being one of two issues being ever released on Lumi Netlabel. In general, it might be an example of synthwave issue because all those sounds seem to be produced by electronic keyboards only though stylistically the release will vary throughout the course. For instance, one of my most favourite pieces within it Fragments Behind Colour has been managed to trudge at an interface between shoegaze, darkwave and concrete music. Indeed, the ill-omened tendencies in sonic creation could be traced in other compositions either, for instance, at Matter In Motion (there are up even some ambient and post-punk progressions thereby reminding of Durutti Column`s aesthetic, for example). In other tracks the music is virtually dominated by minimally designed synth progressions with subtle ambient flavours. Furthermore, not only synthesizer- induced sounds do arouse one`s minds and feels because there is a flock of rhythms of diverse kind which used to draw mind-boggling patterns and all of the at will be amalgamated into the synergic whole. The listener could feel himself/herself to be subjected to intriguing audible manipulations and compounds where no one could feel himself/herself lonely. Even if he/she feels himself/herself lonely then it is a quite different sort of loneliness because of being caused by a crafty aesthetic burden which necessarily comes over you. 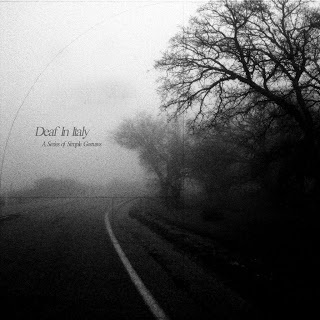 It could finally be said Deaf In Italy`s A Series of Simple Gestures is the solid streamlined drift between poppy indie electronica and elegantly rejecting dark-hued art pop.